Boil a large pot of water (large enough to accommodate the potatoes), and prepare an ice bath. While waiting for the water to boil, slice the potatoes 1/4-inch-thick. Set aside. Remove and discard the spines from the kale, then chop the remaining leaves in 1/2-inch-thick ribbons by stacking the leaves and slicing in the direction of the veins. This doesn't need to be exact, as long as you end up with a pile of roughly 1/2-inch-thick shreds of kale. In a large bowl, combine the olive oil, garlic, salt and pepper. Add the kale and rub the olive oil mixture into the leaves. 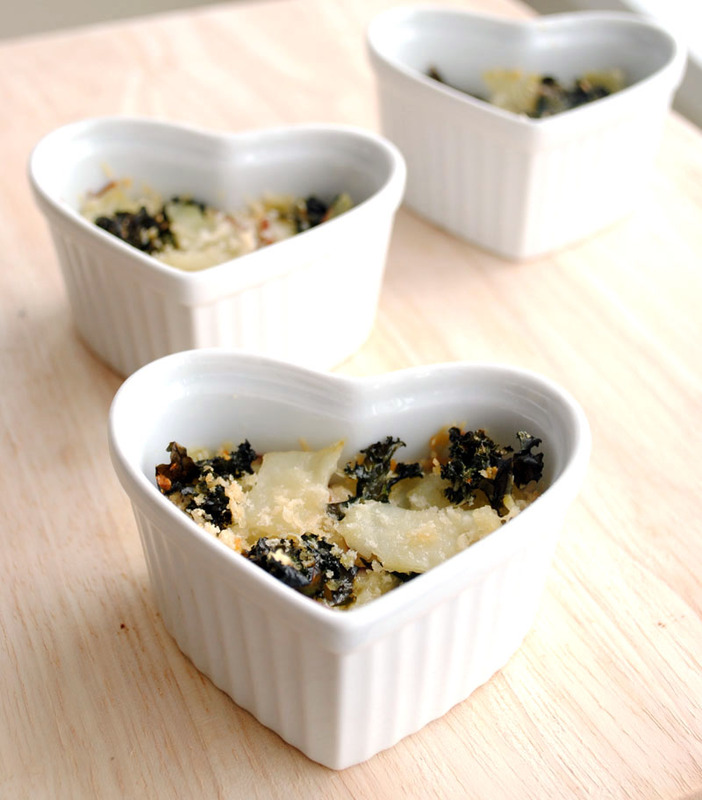 Layer the kale and potatoes alternately with a sprinkling of bread crumbs and Parmesan in small serving dishes (or a 9"x12" rectangular casserole dish). Proceed as directed above, layering the bread crumbs between the potatoes and kale.